by one of the youth in the program. 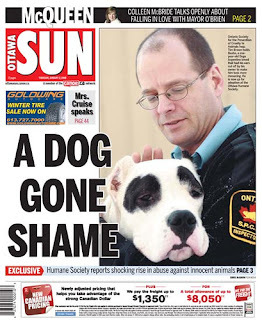 Many people don’t know this, but years before I worked for the Ottawa Humane Society, I worked for the Youth Services Bureau of Ottawa-Carleton (YSB) for over 11 years. Because of my long history working with troubled young people, it’s not surprising that one of the OHS programs that most engages me is L.E.A.D. L.E.A.D. stands for Leadership Education with Adolescents and Dogs. The Program pairs “needs-work-before-adoption” dogs with young people at-risk, generally at the Roberts-Smart Centre on the Royal Ottawa Campus, or at a YSB detention Centre—like the current session. Over several weeks, the young people learn to groom and train the dogs. 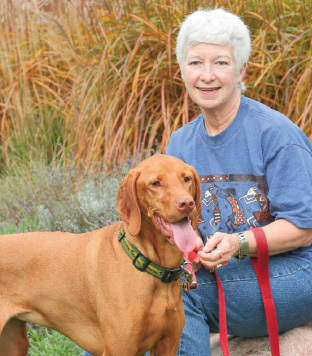 Through the program, dogs become more adoptable. But much more amazing things happen to the young people. The OHS Humane Education coordinator tells me that the program staff and volunteers begin as strangers and intruders, but shortly after the dogs arrive, they are guests and confidants. The young people learn to communicate better with a creature that doesn’t judge. They learn empathy for a dog that is, in many ways, like them. They learn compassion for an animal that depends on them. Dogs and young people together are a natural. When we can help both adjust to the world better, it’s just short of a miracle. Click here for more information about the L.E.A.D. 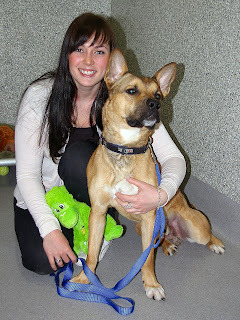 Prgoram and other Humane Education initiatives at the OHS. Shout out to the good people of this world! Given the number of particularly difficult and upsetting cases recently, it is easy to forget that most people are good. Today, let’s devote some blog space to the good people, instead of the criminals. Most people care at least a little about animals, maybe not to the point of devoting their lives to them, like our staff, but at least to the extent that they understand the bigger picture: we all share one planet, we are one society, and how we treat our society’s weakest members is the ultimate measure of our humanity. In yet another shocking case, this month our Rescue and Investigations Department charged a couple who so severely neglected a pot bellied pig that its hooves grew approximately 1.5 feet long, curling around and extending back into the bottom of its feet, preventing it from standing or moving normally. The pig was suffering with what was likely excruciating pain, as well as a permanent hoof and chronic joint abnormality caused by the overgrown hooves. We had to euthanize her to relieve her suffering. Beyond our disgust at this outrageous level of neglect, and our hope that the severest of penalties are meted out to the perpetrators, we are reminded why our municipality restricts the species that can be kept as pets in the City. Pot-bellied pigs are not allowed, nor are a lengthy list of other animals. The OHS supports this – strongly. Too often, the particular care needs of exotic pets are ignored in the rush to acquire the latest trend. Reptiles—most recently, slider turtles—have become the latest worrying trend. We see the consequences in the form of neglect, or simple surrender to the OHS, leaving us to cope with the influx, care, and rehoming needs. 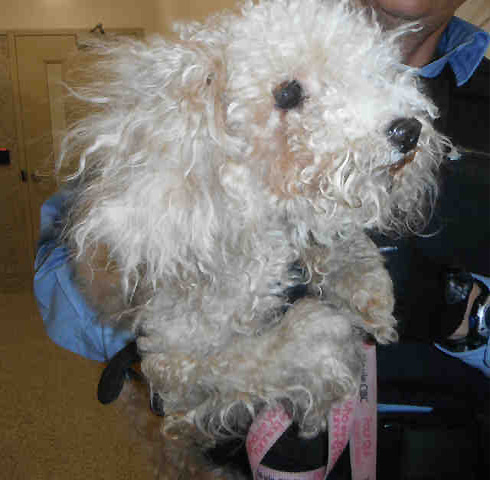 A miniature poodle named Mistletoe was rescued by Ottawa Humane Society Rescue and Investigation Services in November. She had been abandoned in an apartment. Her fur was severely matted. At the OHS, staff gave her love and affection – and the veterinary treatment she so badly needed. 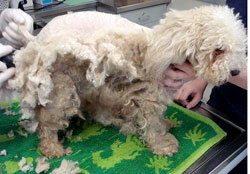 Her matted fur was shaved her down completely and she was given a chance to adjust to the shelter routine. The 11-year-old poodle needed dental work as well as spaying before she could be available for adoption. 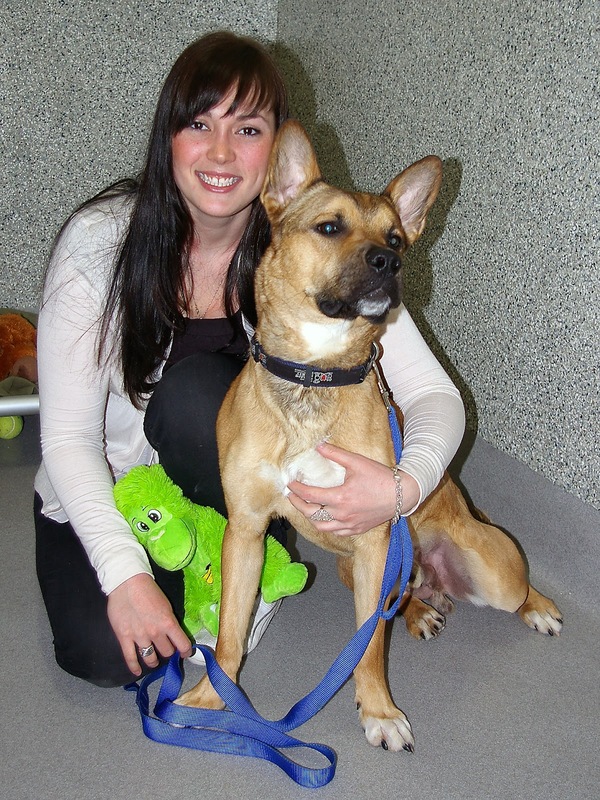 The OHS veterinary staff performed these much needed and lengthy surgeries to get her ready for her new home. Despite her age, Mistletoe is a very affectionate and active lady – she loves to jump into a lap for a cuddle. Her sweet and gentle nature shone through during her time at the shelter. Mistletoe was looking for a quiet place to retire to, so she could forget about her matted fur and sore teeth and just give love and cuddles to her new family. 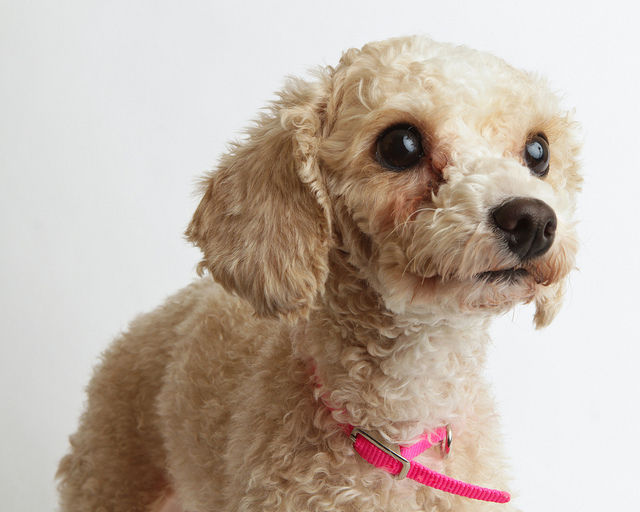 This silly and sweet poodle found what she was looking for and went home with her new family at the end of January. Mistletoe came to the shelter fragile and shy, but she blossomed into a new dog by the time she was adopted… her haircut wasn’t the only part of her transformation. A 2008 article reported a rise in abuse against animals. Four years later, cruelty cases continue to disturb us. Just when we think we have seen the worst, a new, horrific and deeply disturbing case of animal cruelty comes to us. The very recent case of an apparently tortured cat left in a dumpster on Morisset Avenue was one of those cases. Once over our initial shock and revulsion though, these cases renew our determination to solve these crimes and to make them a thing of the past. We can only solve these heinous crimes with the support of our community as a partner in our investigations to bring perpetrators to justice. We rely heavily on the community to be our eyes and ears, to bear witness to crimes against animals, and to donate the funds for the work of our Rescue and Investigations Services Team. We were very gratified that several outraged souls both locally and across the country have pledged funds for a reward for anyone providing information leading to an arrest. You can help. Please spread the word that we are looking for witnesses in this case, that there is a reward and that we need them to come forward. Click here to read the OHS press release about this case. Click here to make a donation to our Rescue and Investigation Services team. In the 60 days between December 1, 2011 and January 31, 2012, the Ottawa Humane Society received 10 litters of puppies and kittens with a combined total of 60 young animals needing care. The estimated cost for daily care, vaccinations, routine deworming and defleaing, quarantines, and spay or neuter procedures for these litters is about $16,000 from the day they arrive until they are adopted. The OHS (and its many foster volunteers) does its very best to care for these puppies and kittens until they can be adopted into their forever homes. You can do your part too. Every year thousands of animals across Canada must be euthanized because they are unhealthy and unwanted, born into poor conditions and not cared for properly. February is National Prevent A Litter month. Spaying and neutering is not only an essential component of responsible pet ownership, but also an important civic duty as a responsible citizen. 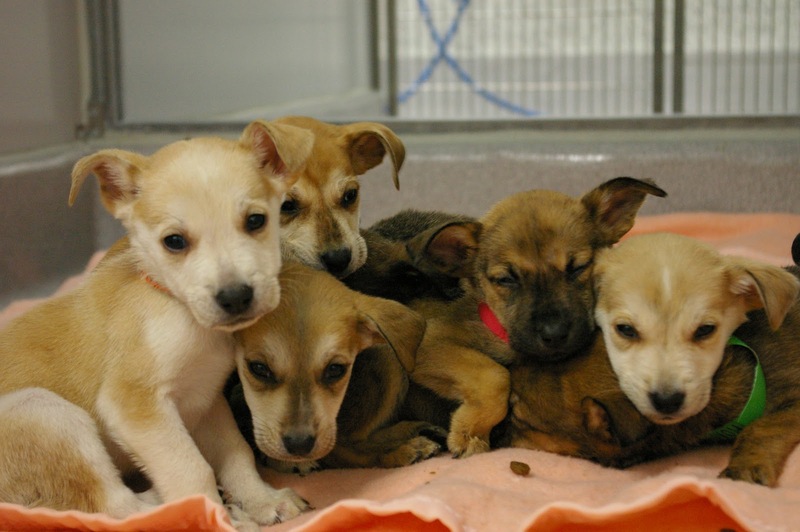 The OHS is doing its part by ensuring that cats and dogs adopted from the shelter are spayed and neutered. Help us help the animals. Spay or neuter your pets. If they are already spayed or neutered, please consider making a donation to help the animals currently in our care – your donation will help us spay and neuter dogs and cats before they go up for adoption. Donations to the OHS can be made by clicking here or calling our fundraising office at 613-725-3166 ext. 252.